For a limited time: $500 discount currently applied to the tuition price (original value: $3,350 physician, $2,830 non-physician). Registration at regular tuition closes 4:00 pm PDT, Friday, September 28, 2018. Late registration tuition includes a $300 processing fee. Scroll down to the “Registration and Cancellation Policies” section for detailed information. Can’t Attend This AFMCP Conference? *IFM is not the CME provider for international programs. Ever wondered what it is really like to attend Functional Medicine’s premier, case-based course, Applying Functional Medicine in Practice (AFMCP)? Take a look into AFMCP by the numbers. Sponsored lunch presented by Doctor's Data Inc. "Comprehensive Stool Analysis: Facilitation of Clinical Success and Patient Satisfaction" by David Quig, PhD. To make your reservation, book online or call 888.421.1442 and mention you are booking in the “IFM – AFMCP 2018 October” room block. Transportation information is provided for reference only and subject to change. 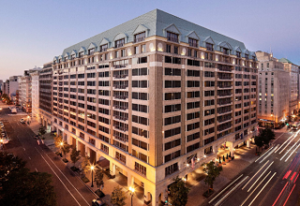 For assistance or additional questions please click here or contact the hotel directly at 202.582.1234. ACCME-accredited courses for AMA PRA Category 1 Credits™ are eligible for Category 2 credit through the American Osteopathic Association (AOA). To obtain the Category 2 credit, please email, fax or mail certificates of attendance to the AOA Department of Client and Member Services. For more information click here. DC: Northwestern Health Sciences University (NWHSU) provides continuing education credit for chiropractic physicians. An application will be submitted to NWHSU who applies to all states, except AZ, KY, OK, NY, TN, and TX. Applications will be submitted for 34.5 CEU hours. For a complete list of states and approval hours, please contact IFM. NURSING PROFESSIONAL: For the purpose of re-certification with the American Nurses Credentialing Center (ANCC) or American Association of Nurse Practitioners (AANP), contact hours approved through ACCME are accepted. Please contact your state nursing board to inquire if continuing education credits from ACCME-accredited organizations are accepted. ACUPUNCTURIST: IFM is a continuing education provider (provider #0232) of the California Acupuncture Board (CAB). The CAB approved this course for 34.5 Category 1 hours. Per the Recertification Handbook of the National Certification Commission for Acupuncture and Oriental Medicine (NCCAOM), courses approved by a state acupuncture regulatory board are eligible to submit with the re-certification application. Please contact your state acupuncture board to inquire if continuing education credits approved by the CAB are accepted. Note: California acupuncturists must attend this course in full to receive CPEUs. Partial credit is not available. Program materials and CME certificates are delivered to you through your personal IFM online account. For this reason, you may not register multiple people or someone other than yourself. Registration at regular tuition will close 4:00 pm PDT, Friday, September 28, 2018. Late registration tuition includes a $300 processing fee. Late registration in-person at the conference (subject to space) will incur a $300 processing fee. Cancellations must be received in writing no later than September 21, 2018, to be eligible for a refund, less a $300 cancellation fee. Cancellations received after September 21 and before October 1, 2018, are eligible for a refund less a $600 late cancellation fee. Tuition is non-transferable. Failure to appear at the program with no prior written cancellation will result in complete forfeiture of tuition and the course will not count toward certification (nonrefundable, nontransferable, no exceptions). Program materials are available only to in-person attendees. Cancellation requests must be received in writing by email or fax: kenleeguss@ifm.org or 253.661.8310. IFM will reply with a written acknowledgement. The highest quality of teaching physicians that I have seen.